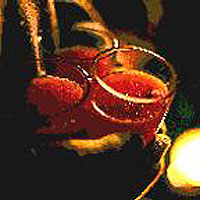 This great tasting drink, suitable for all the family, is wonderful to have at the bonfire party or with your supper. Adults can add a dash of brandy for extra inner warmth. Place the cranberry and orange juice, cloves and cinnamon stick in a saucepan and warm gently - do not allow them to boil. Remove the pan from the heat and leave for 5 minutes, to allow the spices to infuse. Stir in sugar and brandy, if using.